Cytoskeleton Inc. offers a set of phalloidin based stains (Acti-Stains) coupled to a number of different fluorophores compatible with popular filter sets such as FITC, TRITC and Cy5. The stains are exceptionally bright and stable and are indeed offered at very economical prices compared to other phalloidin based stains coupled to fluorophores of similar stability. Left: Swiss 3T3 cell stained with anti-vinculin (red), Dapi (blue nucleus) and F-actin is stained with Acti-stain™ 488; Mid: Swiss 3T3 cell with activated Rho, nucleus is stained with Dapi (blue) and F-actin is stained with Acti-stain™ 555; Right: Mitotic Swiss 3T3 cell, F-actin stained with Acti-stain™ 670, nuclear DNA stained with Dapi; Source: Cytoskeleton Inc.
Up to now, the options for live cell staining of Actin (as well as Tubulin) were limited. The only methods for live cell imaging available so far have been systems based on expression vectors which have to be transfected to target cells. 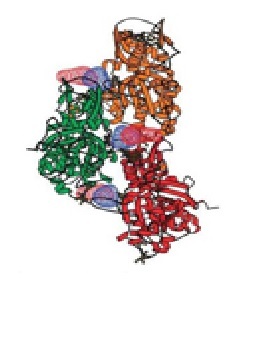 In the case of Actin, a binding protein is coupled to either GFP or RFP and thus is expressed in target cells which leads to a labeling of F-actin. Such an experimental approach can bring major technical hurdles such as transfection efficiency and duration. Spirochrome recently released unique fluorescent stains for monitoring Actin (and Tubulin) easily in living cells. These fluorescent stains (SiR-Actin and SiR-Tubulin) are cell permeable compounds which stain F-actin (and microtubules, respectively) in living cells. 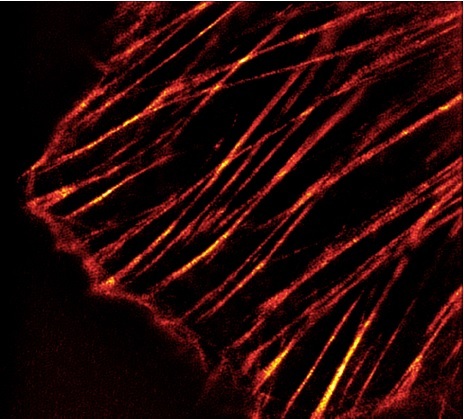 3D-SIM microscopy image of labeled Actin stress fibers in human primary dermal fibroblasts. Source: Spirochrome. If you’re interested in more information about these stains, take a look at my recent post 2 new Actin and Tubulin live-cell imaging stains – without transfection! What do you think about these products? Have you tried any of them already? Leave your questions or comments below!